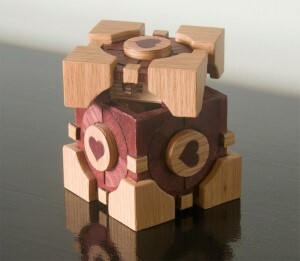 Apart from just being a beautiful object, this thing is a companion cube from the video game Portal. 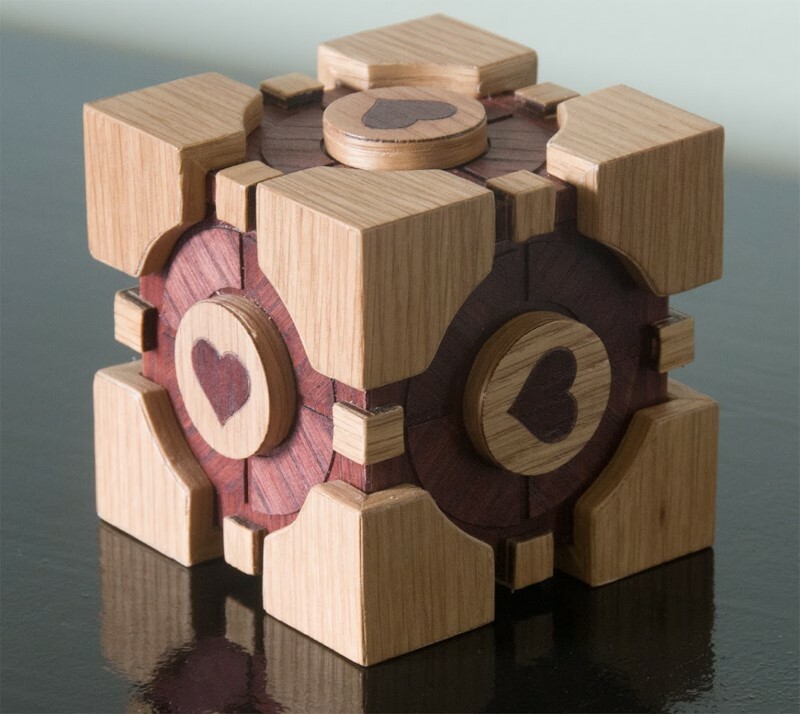 Steve made this cube operational which serves as a box that can only be opened with centrifugal force and turning the round portion that has a heart at the center. Click here to see all of the images showing the assembly process and all of the parts that make-up the cube. Quarter inch plywood was used for the main box and a thinner veneer material was used to create the finer detail around the exterior of the cube. It is apparent that the thicker quarter inch ply was cut using his blackToe CNC router. The veneer has a slightly burnt edge, so it is clear that the details were made with his laser cutter. If you didn't know that this box opened, most likely, you would not even try. The locking mechanism uses four small metal cylinders. The cylinders are positioned within notches aligned from the center of the side of the box. If all cylinders are at their outermost position, the circular portion will be able to turn. Otherwise, the cylinders will block the circular motion since the notches intersect the connection between the circle and the remaining side. Only spinning the box will allow all of the cylinders to be positioned correctly to allow the circle to turn, and the circular portion also has locking levers that move into position to allow the side to be removed from the cube.